John Hancock Tower, also known as Hancock Place or just The Hancock, is located at 200 Clarendon Street in Boston, Massachusetts. The modernist skyscraper is made of steel with a glass and blue curtain wall façade. It stands 789.99 feet tall and has 60 floors. Designed by Henry N. Cobb of I.M. 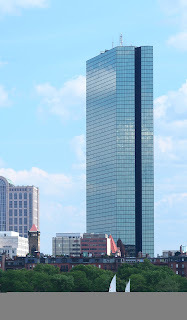 Pei & Partners, it is the tallest building in New England. The tower’s construction began in 1972 and was completed in 1976. John Hancock Tower has won two awards from the American Institute of Architects: the National Honor Award in 1977 and the Twenty-Five Year Award in 2011. It also earned an Energy Star Award in 2006. The tower has over 10,000 reflective glass panes. When construction began, the design included double layer mirror glass windows, but several of these fell from their mullions during harsh winds. The panes were then replaced with single thickness glass.